Runtime: 5 hr. 0 mins. Fathom Events and Showtime bring power, speed and a clash of styles to the big screen when two of boxing's most explosive punchers go toe-to-toe for the welterweight world title. 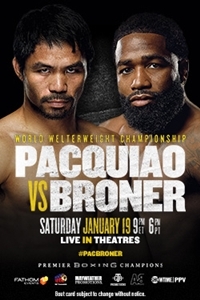 Boxing's only eight-division world champion Manny "Pacman" Pacquiao returns to the U.S. to defend his title against former four-division world champion and must-see attraction Adrien "The Problem" Broner. Get ready for explosive action from bell to bell on Saturday, January 19 LIVE in theatres!